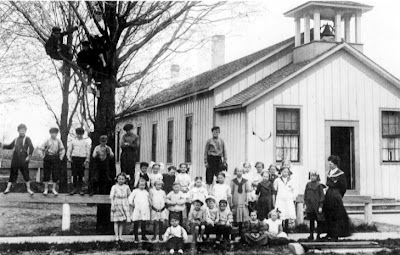 As enrollment in rural schools declines, smaller communities have been left with no viable alternative but to consolidate their schools with neighboring towns. Typically this leads to a lot of hyphenated names for the resulting school districts, such as (in our part of Minnesota) Zumbrota-Mazeppa, Elgin-Millville, Dover-Eyota and the like. Sometimes the district comes up with a whole new name for the school, as when Rose Creek, Adams and Elkton combined to become Southland. I believe my wife Lisa’s home district set the hyphenation record when New Richland-Hartland combined with Ellendale-Geneva to become…you guessed it…New Richland-Hartland-Ellendale-Geneva, which the sportscasters abbreviate as NRHEG. Sometimes they’ll pronounce each letter, but if they’re in a hurry they just say NURR-heg. A similar phenomenon has happened over the last half-century in the newspaper business, as competing newspapers in a community combined because neither could sustain themselves economically. So in Minnesota’s largest city the Minneapolis Star and the Minneapolis Tribune, which I remember as separate papers in the 1980s, became the Minneapolis Star Tribune. Likewise in Milwaukee the Journal and the Sentinel became the Journal Sentinel in 1995. Hyphenated or not, you can probably think of several combo newspapers like this (e.g. Seattle Post-Intelligencer) – feel free to chime in with your examples in the comments. But what happens when even the combined papers can’t make it? When even hyphenation can’t make the business model work? We’re seeing that this week with the announcement that the Times-Picayune of New Orleans will be ceasing daily publication in the fall, moving to three days per week: Wednesday, Friday and Saturday. If a metropolitan area of 1.2 million people can’t support a daily print newspaper, that’s a significant milestone in the decline of the traditional newspaper business model. Employee layoffs are coming there, too, which is the continuation of a trend being tracked at Paper Cuts. As Seth Godin and others have said, newspapers aren’t primarily selling news to subscribers; they’re attracting subscribers and renting their attention to advertisers. The new publishing schedule of the Times-Picayune makes this explicit, as Wednesday is the traditional day for advertising inserts. With so many choices for consumers in how they will get their news and entertainment, the mainstream media oligopoly is much less profitable than it was a generation ago. Those traditional media players have some built-in advantages. but the barriers to entry that formerly protected them (FCC licenses and the huge amounts of capital needed to buy transmitters or printing presses) are now practically non-existent. Don’t just pitch the media. Be the media. Do pitch the media. Work with the existing outlets as a resource and help them serve their audiences. But be the media too. If you have a story to tell, you can do it through a blog. And you aren’t just limited to text: you can embed video, audio, slide presentations, photos and other resources. It costs you literally nothing to start. Have you taken the blogging plunge? If not, why not?